Nariño, Nariño! The mere sound of the name raises expectations. This little state is located as far south in Colombia as you can get, just north of border with Ecuador. And it as has a reputation for exceptional quality that has endured for decades. Nariño is known for producing some of the most mouthwateringly sweet and juicy coffees in the country. Yet for the last few decades, individual producers there have struggled to get recognition for their coffees. More importantly, they have not been reliably rewarded for the quality they produce. The civil conflicts in the area and its remoteness have further combined to discourage investment and slow the pace of progress relative to some of the other highland growing regions in Colombia. In the last ten years, departments like Huila and Cauca have had relatively good success in connecting growers with premiums for quality. By comparison, Nariño has remained largely untapped: as recently as 2012, fewer than 4% of growers in the region had access to markets that pay quality premiums, and over 98% of the coffees produced were bulked and sold as homogenized lots into the mass market for marginal premiums. The CRS Borderlands project aimed to change that by fomenting a culture shift around coffee production that helped growers reorient toward extreme quality as a means of advancing their incomes. One of the shining stars of the project is Arcafé, a vibrant association of coffee farmers from a small town called Linares historically known more for its sugar cane and coca leaf than its coffee. For the last five years they’ve been training, working both as individuals and as a group, to push their coffees to their highest potential by micro-managing cultivation and processing details. Getting coffee to realize its potential and sizzle in the cup is a craft that requires both patience and persistence, and is incredibly hard even for farmers with deep pockets and easy access to resources. It is an order of magnitude more challenging for farmers working from a base of relatively few resources, and the degree of difficulty is compounded for groups. In addition to figuring out how to optimize their coffees individually, they must also learn to work as a team because their coffees are mixed and sold together. For several years now they’ve had some outstanding individual successes, and Intelligentsia regulars may recognize the names of some of these farmers—people like Corona Zambrano and Fidencio Chamorro—who have produced gems in recent years that we’ve sold in our stores to much fanfare. This season they took a major step forward as a group, and this new harvest release from Arcafé is the fruit of their incredible labor: the exciting result of many years of effort and collaboration. It is a delicious example of what is possible when people combine their energies for a common good, and proof positive that Nariño deserves its reputation for uncommonly good quality. I began working in coffee nearly 15 years ago. During that time I have been on more farms than I can remember and taken more photos than I can count. But I can’t recall a farm photo that means more to me the one of the old friends above. The content may seem unremarkable. But the improbable backstory of this photo validates everything I have come to believe over the past 15 years about specialty coffee: that quality-based differentiation is the most reliable source of value for smallholders; that long-term relationships are the most viable approach for sustained smallholder participation; that varietal diversification is an effective strategy for mitigating risk in the field and seizing opportunities in the marketplace; that there are still, even in coffee origins as established as Colombia, growers producing exceptional coffee in relative obscurity without direct access to markets willing to pay premiums for quality; and most of all, that specialty coffee can be an engine of inclusive economic growth in the communities where it is grown. I first met Corona Zambrano nearly five years ago when I was working for CRS leading the Borderlands project in southern Colombia. Our project design was based in part on the belief that the areas where we were working in Nariño were capable of producing exceptional coffees, even though few growers there were accessing significant premiums for quality. So in 2012, we collected green coffee samples from roughly 80 farms from more than 1,500 participating in the project to test our hypothesis. Doña Corona’s was one of them. When I first took notice of Doña Corona, she was a name on a spreadsheet, the grower of one of the randomly selected coffees that scored over 87 points and delivered a powerful validation of our hypothesis. The following year, Doña Corona came to my attention again, thanks to our friends at the exporter Caravela who were helping us get Corona’s coffees into the hands of roasters willing to pay premium prices for them. While they were processing samples from her farm, they noticed a big discrepancy between the sizes of the seeds we sent. They sent us a photo with the seeds from the sample grouped into two separate piles, one with average-sized Castillo, Caturra and Colombia seed, and the other with large, oval seed Caravela believed to be Maragogipe. It was just the pretext I needed to arrange a visit with Doña Corona, one of a handful of women throughout Nariño whose coffees seemed to be continually outperforming all the rest. To be honest, her farm was underwhelming. It was not significantly different from the other countless farms I had visited in the region. In fact, she had less shade cover than many of those farms. Less vigorous plants. Less active soil conservation practices. Less evidence of an overall organization plan for the farm. And it was small, under four hectares. But her coffees were delicious. And sure enough, she did have a small grove of Yellow Maragogipe plants near the ridge at the top of her farm. When she showed them to me, she told me she was planning to tear them out and replace them with disease-resistant Castillo plants. I had seen many farms ravaged by coffee leaf rust, so I understood the impulse. But I had also tasted Maragogipe varietal lots and seen them command high prices in the U.S. market. I didn’t try to talk Corona out of renovating with Castillo, but I did convince her to wait just a few weeks. I proposed bringing in some of my roaster friends to visit the farm, cup the coffee and contribute their perspectives to Corona’s decision-making process. That group of roasters included Geoff Watts, Intelligentsia’s Vice President of Coffee and Colombia Green Coffee Buyer. I took the photo below during that visit, just as Geoff was cupping Corona’s coffee. 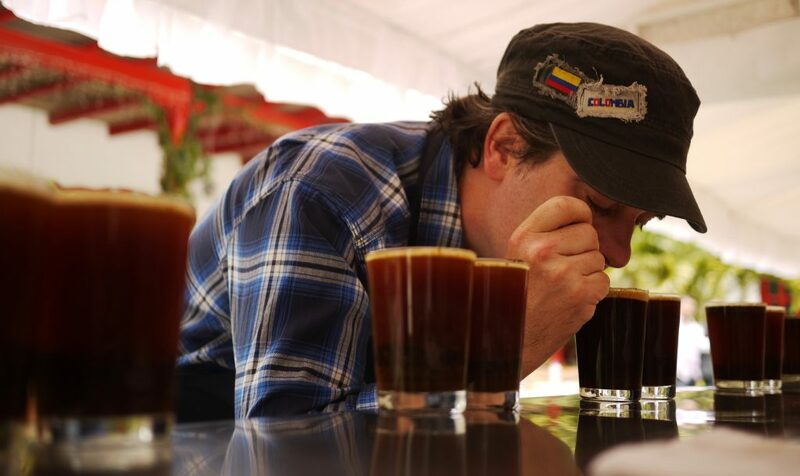 Geoff cups Corona’s Yellow Maragogipe for the first time in 2014 during a visit to Colombia. It is hard to overestimate how long the odds were five years ago against Corona becoming a celebrated coffee grower. Five years ago, Corona was a price-taker: she delivered her coffee every year to the plaza in Linares, where she had little choice but to accept the prices posted at the buying stations there, earning narrow margins in the best years. This year, she sold her coffee directly to a U.S. roaster for the fifth year in a row, and negotiated a price for this lot that was more than three times the local market price. Five years ago, Corona was an anonymous participant in supply chains designed to source and blend large volumes of homogenized coffee. Today, her coffee is being separated and offered as a single-farm varietal lot to some of the most discriminating consumers in the United States in a bag that bears her name. Five years ago, Corona had never met a coffee buyer. Now Geoff visits her farm every year so we can review the previous harvest, plan for the next one and put in place the kinds of guarantees that help to mitigate the risks she takes on the farm on our behalf. If her farm hadn’t been randomly drawn from a hat, we may never have met her. But it was, and we did. If the folks in Caravela’s lab hadn’t spotted the Maragogipe seed in Corona’s sample and called out attention to it, we might not have made the special effort to visit her farm until it was too late for this coffee. But they did, and we did. If Corona hadn’t been willing to take a risk on a low-yielding variety susceptible to coffee leaf rust or a quality-first strategy, or if we hadn’t provided appropriate incentives for her to do so, this coffee might never have found its way to market. But she was, and we did. The result, more than five years after we started on this journey together, is this tiny, beautiful and altogether unlikely lot of Yellow Maragogipe, one of the finest coffees from the Southern Hemisphere we will release this year. And it’s not just Corona’s Yellow Maragogipe that stands out on the cupping table. Her mixed-variety lot is always one of the top coffees we get from her region. And it’s not just Corona: her neighbors have followed her example and cast their lot with a quality-first approach, as well, becoming part of our annual Tres Santos Colombia single-origin offering. None of that context is visible in the photo, of course, but everything in the photo reminds me of it. The most telling detail in the photo, the one that speaks best to the depth of the quality focus Corona has developed over the past five years, may be the coffee cup in Geoff’s hands. Smallholder coffee growers commonly serve you their own coffee when you visit them on their farms. But even the ones who routinely produce exceptional coffees rarely drink great coffee at home, usually roasting defects and rejects, and so doing poorly over open flames in their kitchens. It makes the ritual a painful one for visitors, who compliment their hosts more out of courtesy than genuine pleasure. But on this visit, Geoff didn’t merely oblige Corona by taking a few brave sips. He liked the first cup so much he asked for seconds. Order our Corona Zambrano Colombia Yellow Maragogipe Special Selection HERE, but hurry: it won’t last long. How do you spell flavor at Finca Takesi? G-E-M.
our Finca Takesi Bolivia Catuai Special Selection. They are the surest validation imaginable that the three letters that matter most for cup quality are G, E and M: genotype, environment and management. Panamanian Geisha is descended from an ancient variety of coffee that first grew wild in the highlands of Western Ethiopia. It migrated to the Americas in the satchels of researchers more than a half-century ago, where it idled in obscurity for decades and seemed destined for anonymity. But in the early 2000s, a farmer in Panama was observant enough to notice a group of coffee plants in his fields looked different from all the rest, curious enough to process and taste that coffee separately, and kind enough to share it with the rest of the world. Typica is the ancient coffee variety from which most of the world’s commercially traded traditional Arabica varieties are descended. Like all coffee, it was born in Ethiopia, but eventually made the narrow voyage on a trade route between the Horn of Africa and Yemen, where that Typica took root and fueled the rise of the world’s first commercial coffee sector. Since Yemen’s seaports linked it to global trade routes, it dominated the global coffee trade for centuries. Typica slowly found ways out of Yemen, smuggled by mystics and merchants, and made its way to Asia and the Americas and repatriated to Africa. Along the way, it mutated, first and most importantly, into Bourbon, whose various selections (from Laurina and Mokha to Pacas and SL-28) and mutations (Caturra) are in wide circulation around the world. Later Typica’s own selections (think Kent, Pache and Pluma Hidalgo) and mutations (Maragogype) have become important cultivars in their own right. Through it all, the noble Typica has endured and retained its trademark sweetness and complexity. Catuai is a cross between Mundo Novo (a spontaneuous cross between Typica and Bourbon) and Caturra (a dwarf mutation of Bourbon) that is generally known more for its productivity than its cup quality. But WHAT farmers grow is only a part of what determines cup quality. WHERE they grow it is at least important. And these coffees were all grown at Finca Takesi, and there is no place anywhere in the world quite like Finca Takesi. It should come as no surprise that every aspect of the physical environment in which a coffee is grown affects its flavor and quality. These factors, often referred to collectively as terroir, include location, temperature, rainfall, orientation, soil composition and quality, shade density and diversity, and more. Every one of these variables is important, but arguably none has a greater influence on a coffee’s quality frontier than elevation. From a quality perspective, the higher a farm lies, the better. As elevations rise, temperatures drop and the maturation process of coffee slows, creating a sweeter and more complex profile. We don’t know of any farm that sits quite as high as Finca Takesi. It is perched precariously in a narrow fold in the Bolivian Andes, clinging to a steep hillside above a deep ravine cut over centuries by the rushing waters of the Takesi River below. The majestic snow-capped peak of Mururata, pictured above, looms above the farm, soaring to an elevation of more than 5,800 m. The farm stretches upward from the Takesi River bed at 1,700 m to a height of more than 3,100 m, with coffee planted over 35 hectares between 1,800 m – 2,500 m. But it’s not just the elevation that makes Finca Takesi’s coffee extraordinary, it’s also the latitude. There is plenty of coffee grown on farms over 2,000 m in southern Colombia, but those farms lie less than three degrees north of the Equator, where temperatures are higher. Finca Takesi lies high in the Andes where the sun burns brightly during the day, but more than 16 clicks south of the Equator, where nights are cool: a climate that translates directly into complexity and sweetness. Throw in volcanic soils with a full meter of soil organic matter in the topsoil for good measure, and Takesi’s environment seems custom-built for quality. There is no handbook for an environment like Finca Takesi’s, where coffee production is pushing the boundaries of what we thought was viable, standard assumptions don’t hold and the rules of coffee farming need to be rewritten. The flowering that marks the start of the cherry maturation process takes place over a period of four months, a staggering fact when you consider that flowering generally peaks during a single month, or perhaps two. As a consequence, coffee cherry matures over a period of 10 months or more and workers on Finca Takesi routinely harvest coffee for parts of six months or more. Carlos and Mariana Iturralde, the indomitable father-and-daughter team behind Finca Takesi, have taken these wrinkles in stride, adopting a flexible and experimental approach to farm management and applying what they learn as they go. If should come as no surprise that they were not daunted by these challenges, since the farm itself is an audacious and unlikely enterprise: there were no coffee farms in Yanacachi when they started laying plans for Finca Takesi more than a decade ago, and there are still none today. The physical isolation of Finca Takesi in a rugged and remote stretch of the Bolivian Andes seems appropriate of its position vis-a-vis most other farms in the world: it sits head-and-shoulders above them. We are proud to be the exclusive U.S. partners of Finca Takesi and the Iturralde family, and we are delighted to offer this year’s Finca Takesi Bolivia Special Selection varietal lots in time for the holidays. They will elevate your celebration, and they are only available at Intelligentsia. Pre-order our Finca Takesi Bolivia Geisha Special Selection here. Pre-order our Finca Takesi Bolivia Typica Special Selection here. Pre-order our Finca Takesi Bolivia Catuai Special Selection here. Or better yet, order all three (a $92 value) for $75 and taste the difference variety can make. This coffee is available for PRE-ORDER now. Orders received by Tuesday, November 28 by 3 pm will be roasted and shipped on Wednesday, November 29. This schedule will repeat itself weekly while supplies last, with orders accepted from Tuesday at 3:01 pm until the following Tuesday at 3:00 pm, with coffees roasting and shipping every Wednesday until this coffee is sold out. Our Direct Trade model has been more than 15 years in the making, and it continues to evolve. 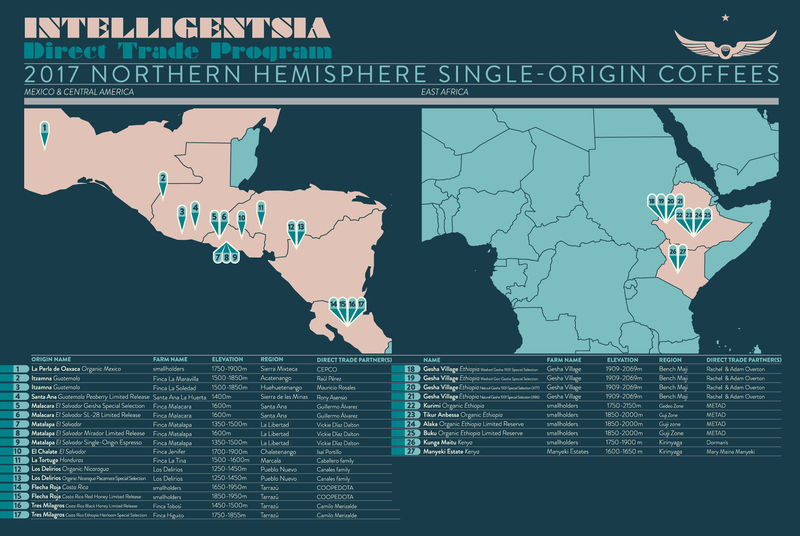 We love to tell the story of Intelligentsia Direct Trade: why we built a Direct Trade program to begin with, how it has evolved over time, who has driven it forward, what it looks like today and where we see it going into the future. It is a sprawling story of continuous innovation that covers a long period of time, involves a large and ever-expanding cast of coffee characters and is always adding new and exciting plotlines. Axioma is part of that effort. It strips away the narrative and presents a small set of carefully selected data points that taken together tell a compelling story about our Direct Trade model. The first edition of the Intelligentsia Axioma takes a look back at the Northern Hemisphere season as we transition into our first Southern Hemisphere releases next week. 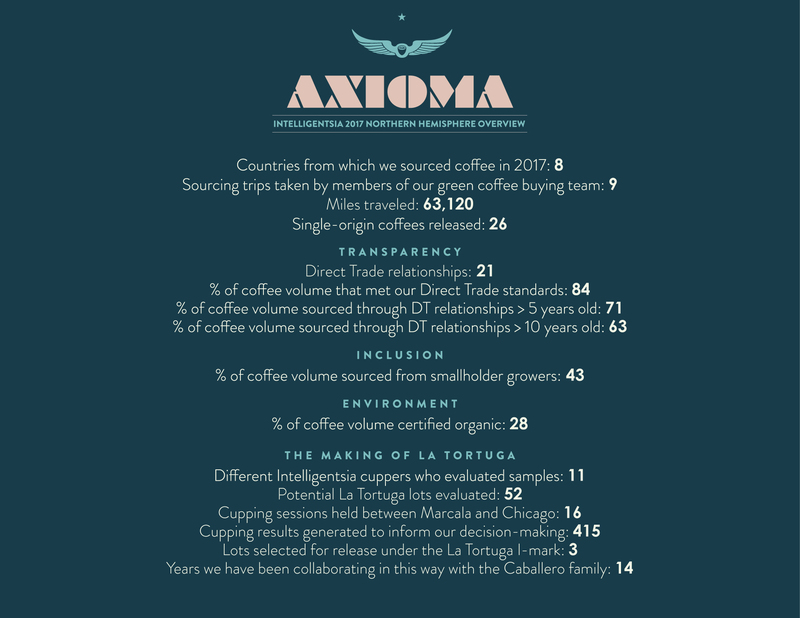 To begin with, we will publish Axioma three times a year: to mark the conclusion of our Northern Hemisphere buying season, again when our Southern Hemisphere buying season comes to an end, and once more in connection with our annual Extraordinary Coffee Workshop. The seasons are changing here at Intelligentsia. Yes, the cold has descended on our home city of Chicago and the winter solstice looms, but that is not the kind of season I am talking about. Next week, we will start updating our single-origin menus to include coffees from the Southern Hemisphere. Over the next few months, our Northern Hemisphere coffees from Central America and East Africa will gradually give way to coffees from Central Africa and South America. This is the concept of seasonality in coffee and the promise of Intelligentsia In-Season: our rotating menu of fresh-crop single-origin coffees is designed to for flavor and ensures drinking the right coffees at the right time of the year. As we make the transition, we look back at our 2017 Northern Hemisphere single-origin releases before they start sharing the menu with our Southern Hemisphere offerings. View our 2017 Northern Hemisphere Sourcing Map HERE. I have been in coffee nearly 15 years. For most of that time, I lived at origin, where I worked extensively with and on behalf of smallholder growers and farmworkers. And frequently during those 15 years, I have been frustrated by how often the people who make our coffee delicious remain anonymous. By how many people remain in the shadows, even in the most transparent supply chains. Fortunately for me, I am now in a position to do something about that. Today I am pleased to announce the Intelligentsia Coffee Credits, designed to give credit for our single-origin offerings where credit is due. Just like the names that scroll up the screen after every film, our coffee credits are designed to be exhaustive, including the names of every smallholder grower whose coffee has found its way into our single-origin lineup, whether they dropped it in ripe cherry form at washing stations in Central Africa or delivered it as parchment to the organizations they belong to in Central America. Every farmworker who harvested cherry at peak ripeness to optimize the sweetness and flavor of the best coffees on our menu. This measure is entirely consistent with long-standing commitment to supply-chain transparency that we share with our Direct Trade partners around the world. The first iteration of our Coffee Credits comes from the Sierra Mixteca of Oaxaca in southwestern Mexico, the source of our current La Perla de Oaxaca Organic Mexico offering. Peruse the names of every grower who contributed to that lot — more than 100 in all — here. Look for Coffee Credits on select releases in our Southern Hemisphere lineup beginning next week. By the time the next Northern Hemisphere buying season rolls around, we expect to publish these credits with every single-origin coffee we release. For everything these growers and farmworkers do to deliver us the cleanest and sweetest coffees in the world, it is the least we can do.